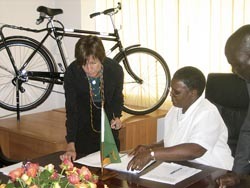 The Zambian Ministry of Education and international relief organization World Bicycle Relief have signed a Memorandum of Understanding that engages the two parties to work together to deliver some 50,000 bicycles to schoolchildren, teachers, and community supporters in Zambias 16 neediest districts. The MoU, signed in Lusaka February 5th, sets forth a program that will distribute approximately 100 bicycles each to some 500 schools in Zambia's nine provinces. Working in partnership with local communities and other relief organizations, World Bicycle Relief will begin distributing the bicycles in June to students, teachers, and community supporters. To further enhance sustainability, World Bicycle Relief will also identify local field mechanics where the bicycles will be distributed to train and supply them with the proper tools and spare parts access to properly maintain and repair the bicycles. Currently, only 20 percent of primary schoolchildren in Zambia complete their grade 12 education. While this problem has multiple causes, one thing that can have an immediate impact is safe, reliable transportation to and from school. Some children travel up to 15 miles - or 5 hours on foot - to and from school each day. Children who walk these distances - especially girls - are at increased risk of harassment and fatigue, and are not adequately prepared to learn. Recognizing the particular vulnerability of female children, and the importance to overall development goals of educating girls, the program favors girls: 70% of student recipients will be girls; 30% will be boys. The World Bank has recognized 'there is no investment more effective for achieving development goals than educating girls.' And UNICEF speaks of the beneficial 'multiplier effect' on society that comes from making sure girls are educated. Increase participation in continuing professional development of teachers. This initiative builds on World Bicycle Relief's successful model of providing bikes to needy local populations that it pioneered following the 2004 tsunami, and then refined for its Project Zambia healthcare initiative. To date, the organization has provided more than 50,000 bicycles through its projects. More information is available at www.worldbicyclerelief.org.